KEELY SUPPORTED BY DISTINGUISHED MEN OF SCIENCE. Is not ether infinitely more rare and more subtle than air, and exceedingly more elastic and more active? Does it not easily penetrate all bodies? And is it not by its elastic force diffused through the universe? - Sir Isaac Newton. "After having had the opportunity of witnessing a series of experiments made by Mr. John Keely, illustrative of a reputed new motor power, it has appeared to me that he has fairly demonstrated the discovery of a force previously unknown to science. I have no theory to account for the phenomena observed, but I believe Mr. Keely to be honest in his attempt to explain them. His demonstrations appear to indicate great mechanical power, which, when applied to appropriate machinery, must supersede all ordinary appliances. "After having witnessed, on several occasions and under favorable circumstances, Mr. Keely's experiments in what he terms sympathetic vibration, I am satisfied that he has made new and important demonstrations in physical science. He has made manifest the existence of natural forces that cannot be explained by any known physical laws, and has shown that he possesses over them a very considerable control. Shortly after there announcements were made public, with the consent of the writers, Anglo-Austria contained two papers on the subject, from which, principally, the article on Etheric Philosophy is taken. S. Zolver Preston, in his "Physics of the Ether," says: "A quantity of matter representing a total mass of only one grain, and possessing the normal velocity of the ether particles, that of a wave of light, encloses a state of energy represented by upward of one thousand millions of foot tons. Or the mass of one single grain contains an energy not less than that possessed by a mass of 70,000 tons, moving at the speed of a cannon ball (1200 feet per second); or, otherwise, a quantity of matter, representing a mass of one grain, imbued with the velocity of the ether particles, encloses an amount of energy which, if entirely utilized, would be competent to project a weight of 100 tons to a height of one mile and nine-tenths of a mile." Etheric philosophy has a scientific basis in fact; and in the light of Keely's progressive demonstrations, his views are no longer abnormal to the scientific mind which is willing to admit the possibility of a discovery in which it has had no part. To discover an unknown power is one thing; to subjugate it is quite another thing. The one may be stumbled over; the other can only be attained after laborious investigation. No one who has followed Keely in his "dead work," during the last ten years, can doubt that he has been, and still is, dealing with the same force which, as Professor Hertz has disclosed to us, is already imprisoned, without our knowledge, in electro-magnetic engines. If thus, unknowingly, it has been made the servant of man, in machinery not especially constructed for its use, may it not also have been imprisoned by one who is adapting his inventions to its special requirements? Keely demonstrates, with what he calls vibratory machinery, that all corpuscles of matter may be subdivided by a certain order of vibration, thus showing up new elements; and having demonstrated what he asserts, by releasing the various orders of ether from the suspension in which it is always held in our atmosphere, he has answered the sceptical demand "Give us some bread." It has been said that as men penetrate deeper and deeper into a knowledge of the wonderful laws which govern the universe they may find mysterious forces which remain still undiscovered. Keely's discoveries promise to burst upon the world of science as the one mighty and complete revelation of the universe. There are more things in heaven and earth than are dreamt of in the materialistic science of our age, or in our philosophy. "All we have cognizance of around us are results, the causes of which are supersensuous. Of the nature which we behold around us, the cause is supernatural." The Reverend Albert H. Plumb, of Roxbury, Mass., who has followed Mr. Keely's efforts, to obtain control of the unknown force which he discovered more than twenty years ago, up to his present successful demonstration before scientists, says: "Neither theological science nor any department of physical science, as it lies in the divine mind, is exactly expressed in any human system; yet no knowledge is to be decried nor despised, least of all in the highest realms of thought. The agnostic makes the mistake of confounding exhaustive knowledge with positive knowledge in declaring both unattainable. We can know positively that a thing is, if not how or why it is. As Gladstone says, 'Our hands can lay hold of truths which our arms cannot embrace. We can apprehend what we cannot comprehend.' If Keely should die, I fear no one could understand his writings. Every day we read of distinguished men dieing. The other day a men carried with him into the grave his secret for the cheap production of aluminium. No one man entrusted by Providence with high interests has a right to allow a possibility of their sinking back, perhaps for ages, into the void of the unknown. Why not confine attention strictly to making the discovery practically intelligible to others, and thus securing to mankind the first steps by which the new force is evoked and controlled, and leave to later leisure the subtler relations of this power to the divine mind and to life?" "909, Walnut Street, Philadelphia, October 4, 1889. "Professor Barker, after due consideration, concluded not to accept the invitation, and declined it on October 11th, suggesting Professor Goodspeed, his associate in physics, as one who would probably be disposed to witness the series of experiments about to be given; showing the neutralizing or overcoming of gravity and the separation of metallic plates by vibration. After the date upon which these latter experiments were to have been made, and which I may mention, enpassant, had been repeatedly made in the laboratory of Mr. Keely, this cablegram was sent from London to Philadelphia:- ' Ask Dr. Leidy's permission to announce here his conviction that Keely has discovered a new force.' "
Invention, in commenting upon the communication, says: "We wish to make it quite clear that we do not identify ourselves with any of the opinions which are expressed in this communication. It is certainly desirable that the motor should be thoroughly tested, and particularly that all the secrecy, which has hitherto been practised in connection with it, should be abandoned. There can be no reason why this invention, if invention it be, should not be published to the world as long as it is fully protected by patents. We agree, however, so far, that Professor Barker's report, if his visit be paid, will be of considerable interest." These remarks of our English contemporary are based upon quite wrong premises. The motor cannot be tested nor patented until it is completed. Mr. Keely's work is one of experimental research. His machine for the production and liberation of the power is in daily operation. He has made many failures in constructing his commercial engine, but each failure has brought him nearer to perfection. When he has succeeded in building an engine is which he can regulate the speed, control reversions and govern its operations, as completely as the steam engine is now governed, then he will be ready to test its action publicly, take out patents for the same, and make known to the world the nature of his discovery. Up to the present time Mr. Keely's inventions have been principally devices, enabling him to experiment with the force which he has discovered and to obtain control over it. For years he was impeded by the frequency of the explosions which took place, breaking his ribs, paralyzing his left side for six weeks at one time, and frequently bursting iron tubes as if they pipe stems. Little by little he learned the laws which governed the unknown force, and now he never has an explosion. Mr. Keely has not preserved any secrecy with regard to his experiments, but on the contrary he has lost much time in exhibiting the production of this force to those who desire to see it. For instance, some years ago be stopped his work on the graduating of his engine to take his liberator to pieces, in order to show its interior construction to Sir William Thompson and Lord Raleigh: these gentlemen, misled by Professor Barker's assertion, that Keely was deceiving his dupes with compressed air, refused to witness his experiments. This was in 1884. There is no "secrecy to be abandoned," therefore. The question to be settled was not one of secrecy, but whether Mr. Keely should continue his experimental research, unimpeded by exhibitions, until he should succeed in perfecting a commercial engine; or whether he should first convince scientists that he is not a modern Cagliostro as he has been called, and that he is a discoverer of an unknown force. The ground taken by those who urged the latter course was that the interest of the Keely Motor Company would thus be better served; reasoning that, when scientists have been convinced that Mr. Keely's researches are in a field comparatively unknown to them, the cries of execration be drowned in the applause which would resound throughout the world as the result of his stupendous labours became better known. For this end several scientists were invited to witness the present stage of experiment, which Mr. Keely had reached in his efforts to provide his provisional engine with a governor, and Dr. Leidy was one of the number who, after witnessing the experiments on May 28th, 1889, confessed himself convinced that Keely was dealing with some unknown force. When we call to mind Watt's persevering efforts during thirty years, before he succeeded in his attempt to invent a governor for the steam engine, we can afford to be more patient with Mr. Keely than we have been. Taking into consideration the marvelous advance which Mr. Keely has made in the past five years in perfecting his liberator, we should not be surprised to hear at any moment that he has also perfected his commercial engine, the so-called "Keely Motor," thus ever coming his sole remaining obstacle to financial success. Those who talk of "testing" the motor, or of patenting it in its present condition, are not aware of the exertions which have been made by Mr. Keely to bring the motor to its present stage of development; nor that, although the motor now seems to be approaching perfection, the work of evolution will not be completed until it is in a patentable form. In 1759 James Watt made his first model of a steam carriage. In 1784 he took out a patent. In 1803 the first engine was built, but it was not until 1824 that the experiment of running a locomotive from Liverpool to Stockport was made. Until Mr. Keely's commercial engine is perfected and patented, now that scientists are beginning to support him as the discoverer of an unknown force, ridicule should give way to sympathy; for we know that nature never reveals one of her tyrant forces without at the same time showing how this force is to be transformed into the slave of man, and that complete success is only a question of time.- Anglo-Austria, March, 1890. Copy of a Letter addressed to Professor Dewar of the Royal Institution of Great Britain. Dear Professor Dewar,- As I have already informed you, I carried out your wishes in reference to Professor Rowland of John Hopkin University, as far as extending to him an invitation to witness some of Mr. Keely's experiments in sympathetic vibration was concerned. Professor Rowland was not able to witness any demonstration whatever, on account of an accident which happened to the disintegrator, and he could not fail to have formed an unfavorable opinion of Mr. Keely from all that transpired on that occasion. I next renewed the invitation to Professor Barker, which had already been extended to him by Professor Leidy, both of these gentlemen being Professors in the Pennsylvania University. Professor Barker was not able to be present. The series of experiments which have been given for scientists, mechanical engineers, and others since my return, closed on the 12th. The steady progress from week to week, since the accident to the disintegrator was repaired, has given beautiful evidence of the wisdom of the plan adopted by Mr. Keely in the winter of 1888-89, which led him to turn his attention to a class of experiments of quite a different nature from those which, up to that time, had been made for commercial ends; experiments which have not failed to convince all who attended the entire series that Mr. Keely is dealing with an unknown force, the laws governing which he is still in partial ignorance concerning. He admits now that he cannot construct a patentable engine to use this force till he has mastered the principle; and a fund, with the approval of scientists, has been appropriated for this end, upon the condition that he will waste no more time upon what is known as the Keely Motor Engine until he has demonstrated his ability to control reversions and in all points to govern the revolutions. His last engine was built to exhibit the practical nature of his discovery to capitalists, the managers of "The Keely Motor Company"- which company died a natural death years since - hoping thereby to raise the price of its stock, and in this way to furnish Mr. Keely with the funds that he needed. But the exhibition of this engine was premature and did not succeed. There will be no further need for such exhibitions in future, for it is, as it always has been, in the interest of stock-holders that the stock should not rise until the system is completed, when in will rise to remain raised. From this time the interest of stock-holders will not be sacrificed to the interest of stock-jobbers. The experiments conducted on Saturday last surpassed preceding ones in the purity of the demonstrations, the instruments being in better condition. In demonstrating what seems to be the overcoming of gravity for aerial navigation, Mr. Keely used a model for an air-ship, weighing about eight pounds, which, when the differentiated wire of silver and platinum was attached to it, communicating with the sympathetic transmitter, rose, descended, or remained stationary midway, the motions as gentle as that of thistledown floating in the air. The experiment illustrating "chord of mass" sympathy was repeated, using a glass chamber, forty inches in height, filled with water, standing on a slab of glass. Three metal spheres, weighing about six ounces each, rested on the glass floor of the chamber. The chord of mass of these spheres was B flat first octave; E flat second octave, and B flat third octave. 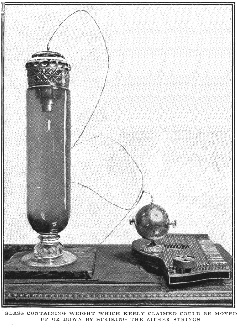 Upon sounding the note B flat on the sympathetic transmitter, the sphere having that chord of mass rose slowly to the top of the chamber; the positive end of the wire having been attached, which connected the covered jar with the transmitter. The same result followed the sound of the note in sympathy with the chord of mass of the other spheres, all of which descended as gently as they rose, upon changing the positive to the negative. J. M. Willcox, Ph.D., who was present, remarked,-"This experiment proves the truth of a fundamental law in scholastic philosophy, viz., that when one body attracts or seeks another body, it is not that the effect is the sum of effects produced by parts of one body upon parts of another, one aggregate of effects, but the result of the operation of one whole upon another whole." The experiments on the 12th closed with the disintegration of water, twelve drops of which we saw dropped, drop by drop, into the small sphere attached to the disintegrator after exhausting the air by suction. A pressure of over 20,000 pounds to the square inch was shown to the satisfaction of all present, and when Mr. Willcox accepted Mr. Keely's invitation to take a seat on the arm of the lever, adding his 260 pounds to the weight, applause broke forth. Mr. Keely showed control of the ether, interatomic subdivision, by graduating the escape of the residue, as he allowed it to discharge itself with a noise like the rushing of steam to an expulsion as gentle as the breathings of an infant. The three subdivisions acted simultaneously, showing instantaneous association and dissociation. The sympathetic globe was operated upon, 120 revolutions a second, ceasing the instant that the wire was detached. I regret to say that Professor Ira Remsen was prevented, I fear by Professor Rowland, from witnessing any one of this series of experiments as he intended doing; nor have I been able to get the opinion of any physicist in whom I felt any confidence; but Mr. Keely is satisfied to have the support of such men as J. M. Willcox, Ph.D., and Professor Leidy, L.L.D. Dr. Leidy was awarded the Lyell Medal in 1884, when in London, and the Cuvier Prize in 1888, from the Academy of Sciences in France. He is known in America not only as possessing the broadest of minds and the gentlest of natures, but as holding in his heart that love for, and reverence of, truth and justice which alone can confer the power of forming a correct and a just judgment. I would like to have you make known in England that Mr. Keely is indebted to Macvicar's A Sketch of a Philosophy for turning his attention, in 1884, to researches on the structure of ether, and to Mrs. F. J. Hughes (not Mrs. Watts Hughes), for the suggestion in her work on Harmonies of Tones and Colours - Developed by Evolution, which led him into the line of experiment that will enable him to show on a disc the various colours of sound, each note having its colours, and to demonstrate in various ways Mrs. Hughes' own words "that the same laws which develop musical harmonies develop the universe," etc., etc. On the 10th of June, 1890, the Rev. John Andrew, of Belfast, whose pendulographs illustrate the ratios which rule in the domain of atmospheric vibrations, in which audible music has been located by the great numberer, wrote: "I think that now, as last, Keely's labours are about to be honorably recognized by the world of science. May he live to rejoice in his triumphs." Mr. Andrew, who was the friend of the late Dr. Macvicar, was instrumental in bringing "A Sketch of a Philosophy" to Mrs. Moore's notice, and has maintained great interest in Keely's researches since he first heard of them. Miss Mary Green, a governess in the family of Lord Wimborne, was another instrument used to make known to Keely the important nature of the energy he had liberated from the suspension in which it is always held in our atmosphere. About this time Professor James Dewar, who had been following Keely's claims as a discoverer since 1884, wrote: "If Mr. Keely succeeds in making his discovery practically useful, as it is said that he is demonstrating to scientists his ability to do - if this information be true, it is strange to contrast the past history of science with the present. Fancy the discoverer of electricity having succeeded in inventing the modern dynamo machine! Such a fact would mean the concentration of hundreds of years of scientific discovery and invention into the single life of one man. Such a result would be simply marvelous." Every defender of the truth, at whom shafts of ridicule are levelled, should recall these words. Never, for one moment, has Keely turned aside from his work to answer his assailants. It is not to be wondered at that the magical nature of his demonstrations, more inexplicable than any feats of legerdemain, should have brought upon him the suspicion of fraudulent representation, concerning the production of the force and its manipulation; but his persistency alone in seeking to unravel the mysteries of nature, ought to have brought around him sooner men who, like the revered and great Leidy, were able to appreciate his researches in sympathetic vibration, the laws of which govern everything in creation, from the movements of the planets, down to the movements of atoms. From the time in which it was made known to Keely that the same principle underlies harmonies and the motion of heavenly bodies, as announced by Pythagoras, his grasping intellect conceived the idea that planetary bodies have a nerve-system, subject to conditions which govern it and keep it under control, just as our human mechanism is controlled by the law which governs its operation. In Keely's theories all is mechanical in nature. A molecule of steel, a molecule of gas, a molecule of brain matter are all of the one primeval substance - the Ether. The instrument devised by Mr. Keely for bringing the air-ship under control in its ascent and descent, consists of a row of bars, like the keys of a piano, representing the enharmonic and the diatonic conditions. These bars range from 0 to 100. At 50 Mr. Keely thinks the progress of the vessel ought to be about 500 miles an hour. At 100 gravity resumes its control. If pushed to that speed it would descend like a rifle-ball to the earth. There is no force known so safe to use as the polar flow if, as Mr. Keely thinks, that, when the conditions are once set up, they remain for ever, with perpetual molecular action as the result, until the machinery wears out. In the event of meeting a cyclone, the course of the vessel, he teaches, can be guided so as to ascend above the cyclone by simply dampening a certain proportion of these vibratory bars. The instrument for guiding the ship has nothing to do with the propelling of it, which is a distinct feature of itself, acting by molecular bombardment; moving the molecules in the same order as in the suspension process, but transversely. After the molecular mass of the vessel is sensitized, or made concordant with the celestial and terrestrial streams, the control of it in all particular is easy and simple. In ascending the positive force is used, or the celestial, as Keely has named it, and in descending the negative or terrestrial. Passing through a cyclone the air-ship would not be affected by it. The breaking up of cyclones will open a field for future research, if any way can be discovered for obtaining the chord of mass the cyclone. To differentiate the chord of its third would destroy it; but to those who know nothing of the underlying principle, on which Keely has based his system, all such assertions are the merest "rubbish." For a few months following the announcement of Professor Leidy's and Dr. Willcox's opinions [see Leidy and Wilcox Visit Keelys Lab], Mr. Keely continued his researches under favourable circumstances; but, in the autumn of 1890, he was again threatened with suits-at-law and harassed by demands to give exhibitions in order to raise the price of stock. A subscription was started to raise funds for the prosecution. These threats made it necessary to make public the history of Keely's connection with an organization which was supposed by many to have been formed for speculative purposes, before the stock of the company possessed any value other than prospective; but to which company, notwithstanding, the world is indebted for supplying Mr. Keely with the means to continue his work, at a time when it was impossible for him to gain the recognition of science or the aid of capitalists. The discovery would in all probability have been lost, but for the help which this organization gave, at a time when Keely needed help; he had made a discovery, and these shrewd business men, totally ignorant of physics, knew enough to comprehend its financial importance. Never doubting that Keely would be able to master the difficulties at once, in the way of its subjugations, and not realizing the width of the gulf that lies between discovery and invention, they expected him to leap it with one bound; and when he failed to do so they threw upon him all the odium which befell the enterprise. Keely, who had twice destroyed his researching instruments, when harassed and threatened by the managers of the company, first in 1882, and again in 1887, was now placed by their threatened proceedings in a position where he had to choose between continuing his researches with the end in view of completing his system; or diverting his course and resuming his efforts to perfect an engine, to continue exhibitions for the purpose of raising the stock of the company. At this juncture an attempt was made to have circulated among the stock-holders a narrative setting forth facts to show that their interest would be better served by a continuance of the researches that had led to the results attained within the last two years; and which were of so important a character as to justify Keely in saying that he had learned more of the two governing the operation of the force he was dealing with, in that time, than in the many preceding years during which he had been scarcely doing more than liberating the ether. The effort to have the narrative circulated failed; and, as a last resort, the history of the company was made public in a pamphlet, entitled The Keely Motor Bubble; which contained the Minority Report of John Lorimer, made, in 1881, when he was a member of the Board of Directors of "the now defunct Keely Motor Company;" giving a mastery analysis of the situation at that time. Mr. Lorimer's faith in, and loyalty to, Mr. Keely, has never been questioned. He is probably the best and most disinterested adviser that Mr. Keely has ever had; among those who are interested solely in the commercial aspect of the discovery.